NINE of the state's most deadly stretches of road will be upgraded over the next three years after the Government announced a $112 million funding injection. Transport Minister Mark Bailey told State Parliament this morning that Queensland Transport had identified 26 sections of high-risk, state-controlled roads, each about 20 km long, requiring safety upgrades. The roads only make up 1.4 per cent of the state-controlled network but account for 10 per cent of the state's fatal and serious injury crashes. Roads set for safety upgrades include the Kennedy Highway ($43.4 million), New England Highway ($19.4 million), Gillies Range Rd ($18.1) and Captain Cook Highway ($2.4 million). 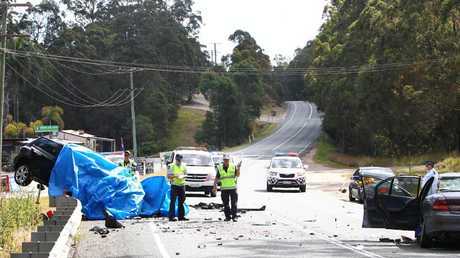 File picture: A crash on a notorious stretch of the Nerang-Beaudesert Rd. Other roads to be upgraded include the Mount Lindesay Highway ($14.3 million), Beaudesert-Nerang Rd ($4.9 million), Bundaberg-Gin Gin Road, Rockhampton-Yeppoon Rd and two intersection upgrades on Mt Cotton Rd. Mr Bailey said 91 jobs were expected to be created.